← Just exactly what was the first major fight among Christians? 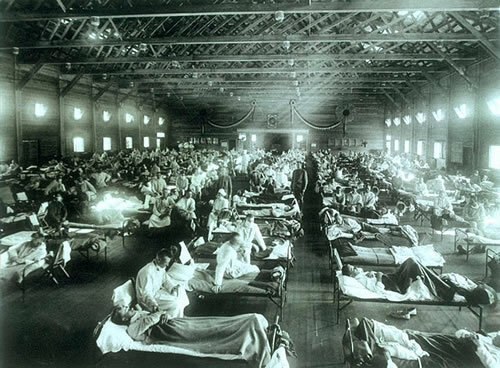 Scientists Revived the Spanish Flu Virus, What Could Go Wrong? [I know this is not new history. My father was 17 in 1918 when this started and was working in a shipyard in Washington state supporting the WW I war effort. He described to me several different times his recollections of fellow workers and military personnel succumbing around him. Historians note that it especially prefered young men, but spread everywhere, and to everyone. This form of flu has been ranked as the deadliest pandemic of all time. For whatever reason, I get flu shots, but can never remember having the flu. Biologists recreated a virus responsible for the 1918 flu pandemic (also called the Spanish Flu) [wiki], which caused some 50 to 100 million people deaths in just two years, from tissue samples gathered from corpses. Some scientists question the wisdom of reconstructing such a deadly virus. Do the benefits outweigh the risks? Those who carried out the macaque study say yes, as a better understanding of how it acts in a system similar to humans’ will help scientists treat future pandemics. The study was carried out in the biohazard level 4 labs of the Public Health Agency of Canada in Winnipeg. Yoshihiro Kawaoka of the University of Wisconsin-Madison and his colleagues infected macaques with the 1918 virus or a contemporary flu strain3. Whereas the contemporary virus caused mild symptoms in the lungs, the 1918 flu spread quickly throughout the respiratory system and the monkeys died within days. The damage parallels reports of human patients in 1918. The team reports that the 1918 virus caused the monkeys’ immune systems to go into overdrive, causing immune proteins to be expressed at abnormally high levels and attack the body — what immunologists call a cytokine storm. By the way, when they sequenced the Spanish Flu virus, the scientists proposed that the virus was derived from an avian source. Bird flu [wiki], anyone? This entry was posted in history, History & eyeball remembrances, mysterious illnesses, new viruses, science, Uncategorized, viruses and tagged history, Personal, recovered Spanish flu virus., science, Spanish flu, Uncategorized, worst pandemic in history. Bookmark the permalink.